The queue forming outside the PAC on the 10th was the first sign that Iridescence 2015 would surpass expectations. Although the unexpectedly large turnout delayed the start of the concert, the audience’s willingness to see it to the end was a testament to the quality of the performances Iridescence offered. 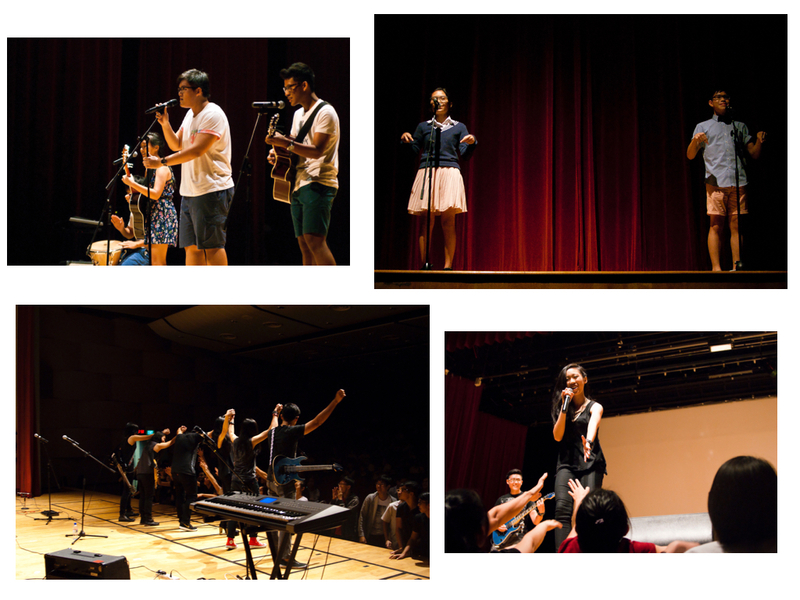 Organized by Year 5s from The Humanz Initiative (THI), Iridescence 2015 was a fundraising concert to aid the elderly at Toa Payoh Care Corner; all proceeds from the concert went to them. Some beneficiaries of Toa Payoh Care Corner had front-row seats for the concert, which also opened with a speech by a representative of the organization. In fact, an Organizing Team member who declined to be named noted that she chose to be involved with Iridescence as it was “a way to contribute to a worthy cause”. Another defining feature of Iridescence was the sheer variety of acts, with both Rafflesians and non-Rafflesians taking the stage. From energetic rock songs to heart-warming poetry slams, the concert certainly did its best to cater to the tastes of every audience member. Despite each performance’s distinct style and content, it was extremely commendable that the concert still ran smoothly from each act to the next without a hitch. Starting off the concert was Jon and Jon, an act comprising Jonathan Chua (16S03B) as the lead pianist, and Jonathan Tan (16S06K) as their lead vocalist. They first performed two hauntingly beautiful piano solo of All I Ask of You and Point of No Return from the musical Phantom of the Opera, followed by Snow Flower. The duo ended their performance by swapping roles momentarily for their final song – Les Miserables’ On My Own – a brave act that truly displayed their admirable team dynamics and diverse range of talents. Following them was Craig Chua of ACSI, who gave a spirited rendition of Sail by AWOLNATION and No Scrubs by TLC. His performance was remarkable for its use of the distinctive step pedal, a device that allowed him to loop audio clips, creating an audio backtrack that complemented his evocative rendition of Sail. 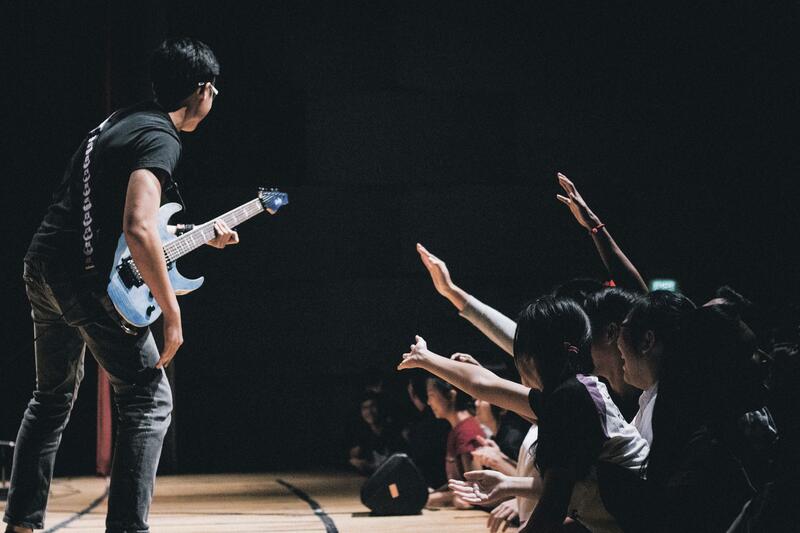 This left many audience members extremely impressed: Dylan Goh (16S06C) commented on how the performance “with the step pedal was pretty cool”, further listing it as his favourite act of the night. 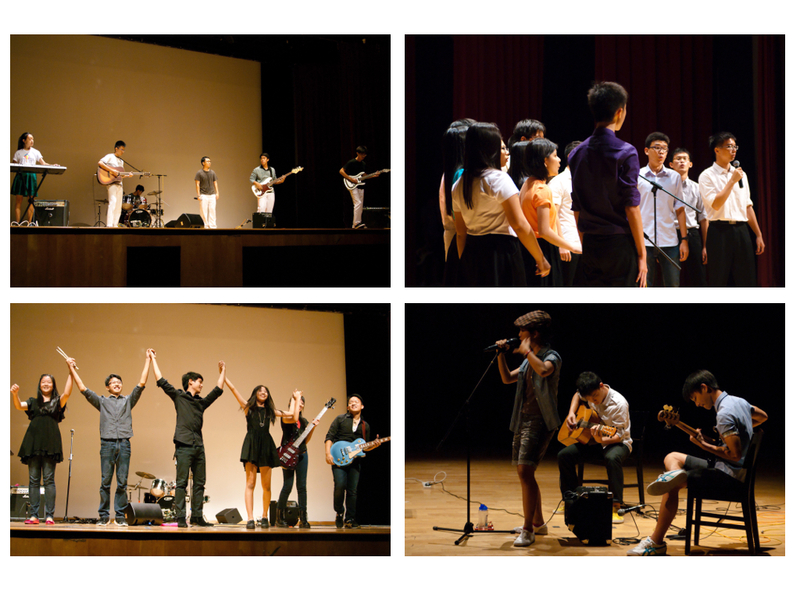 Craig was succeeded by String Theory, a band from ACSI comprising Kristi Lim, Jordan Yoong and Joel Ong. Despite vocalist Joel Ong’s sore throat, the group didn’t disappoint with their sweet, soothing renditions of ballads such as Jeff Buckley’s acclaimed cover of Leonard Cohen’s Hallelujah, Great Big World’s Say Something, and One Republic’s Secrets. Outside of their heart-wrenching and laudable vocal performance, the group’s charming outfits and futuristic-looking instruments– such as their electric violin– left a nothing short of a good impression on the audience. Up next was the first half of the poetry slam instalments for the night. To provide some context, poetry slam in its simplest form is performed or spoken poetry. 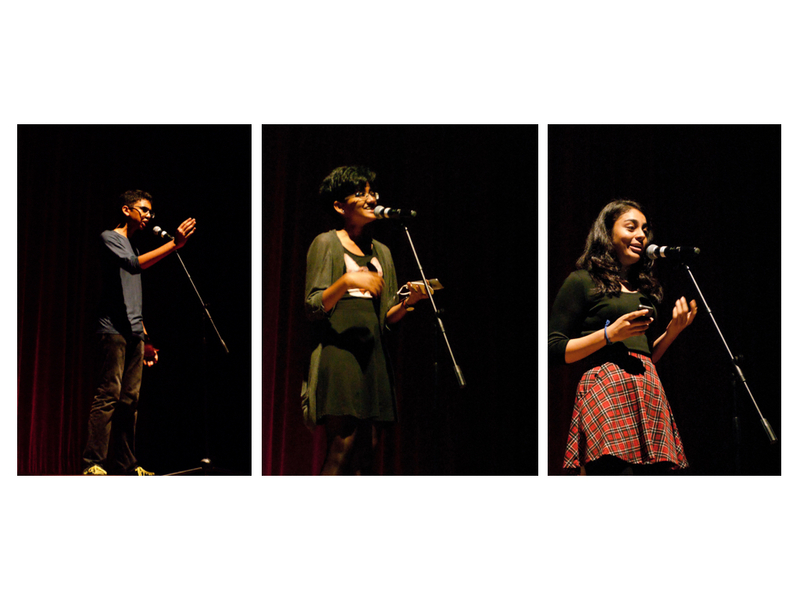 The first three slammers were Rishi Vadrevu (16A01E), Neha, and Pranamika, the latter two being students from Anderson Junior College who had volunteered for the event out of ‘interest in exposing students to the power of spoken word’ and ‘to use [their] passions to help a worthy cause’. Rishi opened the performance with a riveting and emotional reading of an original untitled poem that poignantly represented the internal conflicts of a teenage boy, and this was followed by Neha’s reading of fellow Rafflesian Khairillah Irwan’s (16A01B) poem: Critical Assignment. The segment ended with Pranamika delivering her two self-written poems about the contrasting experiences of being in healthy and unhealthy relationships that resonated deeply with many members of the audience. Following the poetry slam was Is That a Drum Set?, comprising students from Raffles Jazz that did indeed have a drummer amidst their talented pool of musicians. Fronted by the exuberant Stefanus Phan (15A01A), the quirkily-named group performed Sunday Morning by Maroon 5 and Left Hand Free by British indie act alt-j. The audience was blown away with the mellow yet thoroughly captivating performances laced with catchy guitar riffs and a surprisingly enthralling laid-back vibe. Rounding off the first half of the night was Austere from Raffles Rock. The group daringly started their performance with their cover of No-Diggity by Blackstreet, and followed through with a powerful rendition of That’s What You Get by Paramore. Lead vocalist Jemi Lu (16S07B) told us that “it hasn’t been an easy journey, but I feel very blessed to be embarking on it with this group of passionate and fun-loving friends.” Indeed, their efforts did not go to waste as they received a rousing round of applause at the end of their dynamic performance. After the break, Iridescence quickly regained momentum with acapella performances by Raffles Chorale, which covered three songs- a mash-up of Thinking Out Loud by Ed Sheeran and I’m Not The Only One by Sam Smith, followed by Rather Be, by Clean Bandit. They ended off their performance with another mash-up, this time of Treasure by Bruno Mars and Suit and Tie by Justin Timberlake. Considering that Treasure was one of the many songs of the Year 5 batch dance, the song likely aroused irreplaceable, sentimental memories of orientation amongst the J1s in the audience. Additionally, the unexpected yet impressive application of beat-boxing across all songs was astounding and carried out well by the spirited performers. At any rate, the Chorale singers injected vibrancy into the PAC post-intermission with their upbeat voices colourful ensemble. 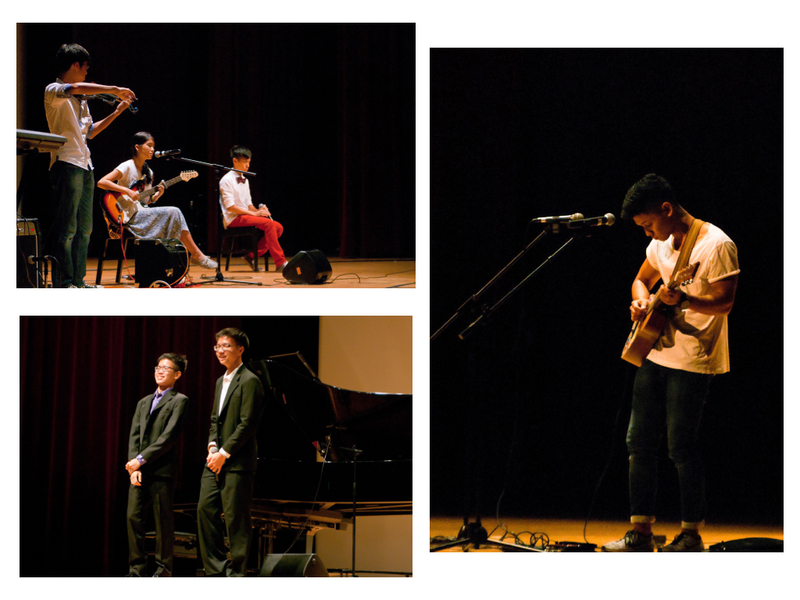 Chorale was followed by Searching, who stole the stage with lead vocalist Kelsie Tan’s (16S07C) impressive vocal range accompanied by Alexander Leung (16A01A) and Deo Teo (16S03S) on their guitars. The trio managed to successfully play on the heartstrings of many within the audience. The group’s mix of songs, American Boy by Estelle and Lost Stars by Adam Levine, was light and peppy. Together with their simple stage design that left the stage largely bare, an intimate atmosphere was immediately fostered as audience members felt an immediate closeness to the performers. Kelsie, in particular, was swaying about animatedly to the songs and capturing the audience’s attention with her infectious stage presence. The promised second segment of poetry slamming did not disappoint, first kicking off with Isaiah Lee (16A01A) enthralling and captivating the audience with his vivid and stirring words, all through a resolute and emphatic reading. Next up, Karen Cuison (16A01D) joined Isaiah to present their duet, completely winning over the audience with a refreshing performance reminiscent of popular spoken word duo Phil Kaye and Sarah Kay. As a potential contender for crowd-favourite, their poem was a charming and relatable piece speaking of the star-crossed paths of two unlikely students from the arts and science streams, which had the audience enamoured. Subsequently, Neha made a light-hearted entrance onto the stage for the second time that night. This time around the talented student from Anderson Junior College presented her own work, Bleach, an insightful and mellow piece on racial identities that many identified with. Following that, Tofu Bloc, who took a special trip down from Dover Road, made their highly anticipated entrance. From their eclectic aesthetic to their enrapturing performance, Tofu Bloc truly impressed that night with their clever array of song mash-ups. They made their mark as versatile musicians who were able to combine the various genres of music into their mash-up, presenting an exhilarating performance that undoubtedly added an exceptional twist to the line-up for the night. Aptly named, The Diversion of Raffles Rock took the stage for the last performance of the night, ending off the concert with a bang. Their high-spirited rendition of cult favourite I Don’t Care by Fall Out Boy re-energised the crowd even at 11pm, with people bounding over to the front of the stage to join in on the action. The enthusiastic crowd’s cheers spurred on these talented, charismatic musicians to go on to give their best in their first ever live performance. With high-intensity, unique performances as well as humanitarian goals, Iridescence was without question a concert worth going to. The organizing team, performers, and audience members expressed little regret in choosing to spend their time with Iridescence. Dylan had nothing but praise for the night’s performances, enthusing that “the music was amazingly good” and he “believe[d] that it was all worth it”, citing the efforts of the Organizing Team. The Organizing Team for Iridescence also expressed their profuse thanks to their teacher in charge, Ms Lye Su Lin, all performers, stage-hands, and audience members, for coming together to make this charitable concert a success. To see more from the The Humanz Initiative, do look out for more upcoming events such as For Sale by One Chair Plays on 3rd May at the Esplanade! Book your tickets now at tinyurl.com/onechairplays. For the past 34 years, Rafflesians have been voting almost religiously for Student Councillors of their choice into a position of power. 34 years on, however, many of us seem to have lost sight of what voting represents. To many of us, voting seems to be a necessary duty that otherwise lacks any significance. This therefore begs the question: why is voting important?